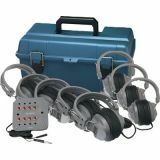 Tough, durable construction with silver contact points to ensure the highest quality audio. 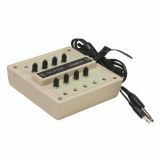 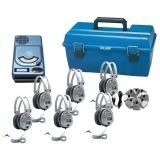 Features individual volume control with pre-drilled holes for permanent mounting. 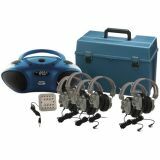 This 4-person listening center features a colorful, fun and sturdy CD Player/Karaoke Machine specially designed for early childhood use. 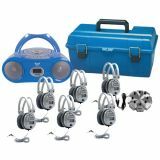 The fun colors and easy functionality of the karaoke boombox along with the deluxe SC-7V headphones, a Jackbox with 8 headphone inputs and a plastic carry case will help create an environment that makes learning fun for years to come! 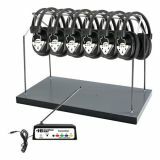 Listening centers are ideal for individual or group study for language applications in libraries and classrooms. 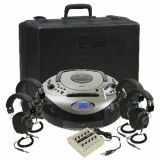 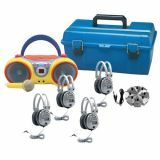 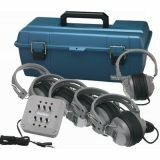 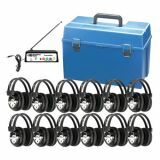 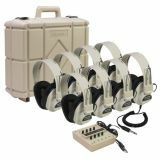 Set includes six monaural 2924AVP headphones, 8 position jackbox with volume control, and a carrying case.